Biomass is one of those truly inspiring success stories. 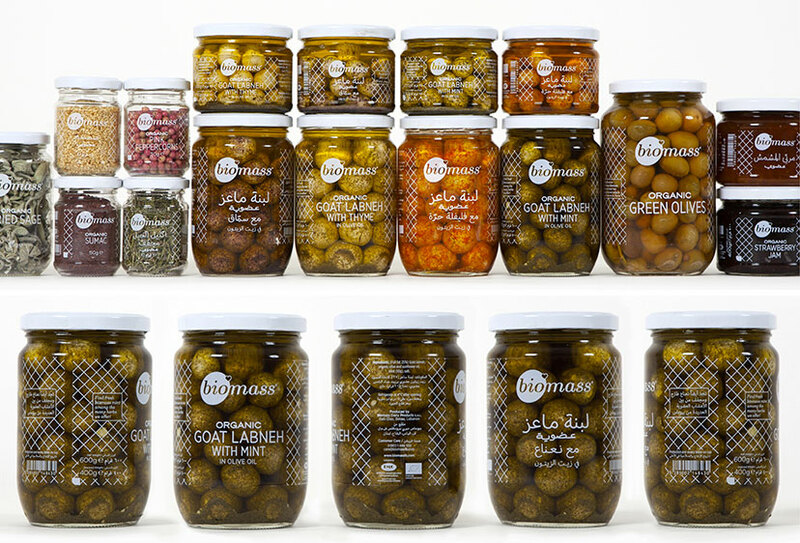 What started off as growing produce on a family farm in Batroun, northern Lebanon, for personal consumption is today the country’s biggest, most diverse and most widespread fully certified organic foods brand, boasting a network of over 40 farmers spread across Lebanon. The drive was simple and honest: if we can eat better, why not everyone else. And this is precisely what our work for Biomass helped do: move the organic offering away from being niche and difficult to find to being a more standard and mainstream household ingredient. 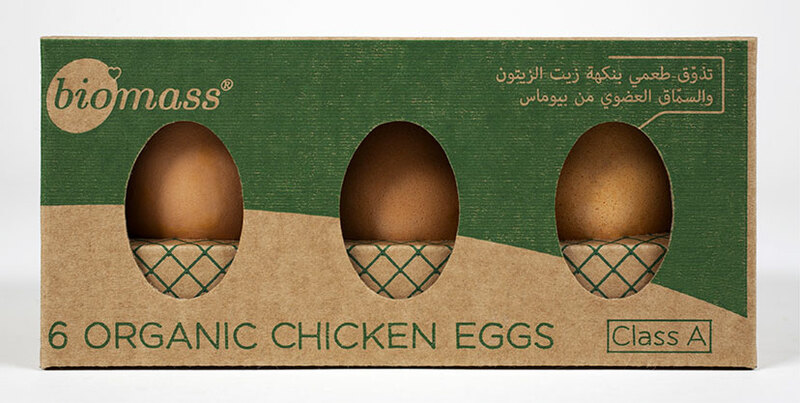 Through a rebranding exercise, packaging development and communication work, the Biomass brand solidified its status as the champion of organic farming, and the main source for organic products in Lebanon that are no longer limited neither in availability nor range. From fresh to dry to processed, the Biomass product lines come close to a fully organic pantry. 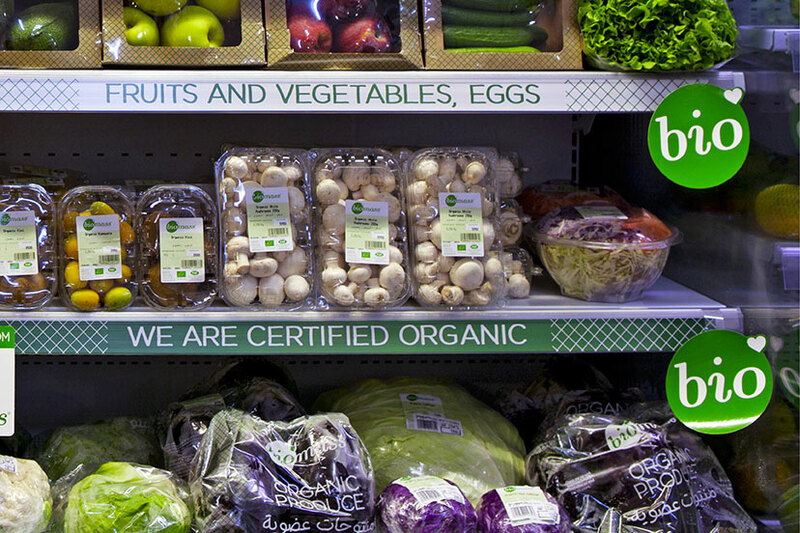 The organic supermarket corner is basically a Biomass corner: a testimony to the leadership status of the brand. 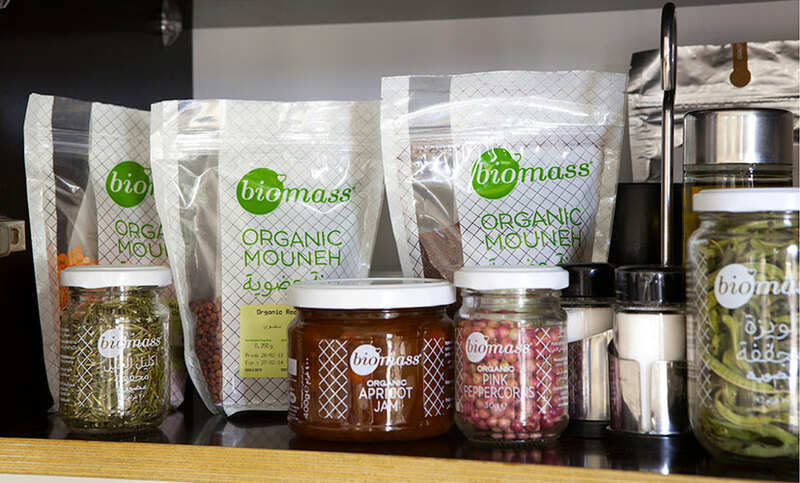 In 2012, amid a growing popularity of organic foods, Biomass had established a certain presence in the Lebanese market and was beginning to be recognized for some items within its relatively small range of products. It was at that time that Biomass – already a kind of leader – was looking to seriously expand its offering and become the main Lebanese organic brand. That’s where we came in. The rebranding began with readdressing the logo in a way that clarifies its naming logic, and then moved to revisiting some of the packaging lines, developing new ones and establishing a communication style with an informative and friendly tone of voice – a key to the perception of the brand as principled, honest and non-alienating. Hand-drawn typography and a simple net pattern complete Biomass’s visual language. The previous Biomass fresh fruit and vegetable packs were more or less retained, but were subjected to a slight but significant form adjustment (see Packaging section for details). The previous Biomass half-dozen egg pack worked pretty well and needed nothing more than a new identity treatment, as well as a dozen-egg partner. The ever growing range of Biomass products fully abides by European regulations for organic farming and includes free range chicken and eggs, grains and pulses, fresh and dried herbs, fruits and vegetables, olive oil and a selection of dairy products and preserves. This variety required a diversification of packaging containers, materials and configurations, designed consistently following Biomass’s brand identity visual language while allowing for enough differentiation per product line. The packaging design solutions take visual as well as practical matters into consideration such as display, storage and economical production. 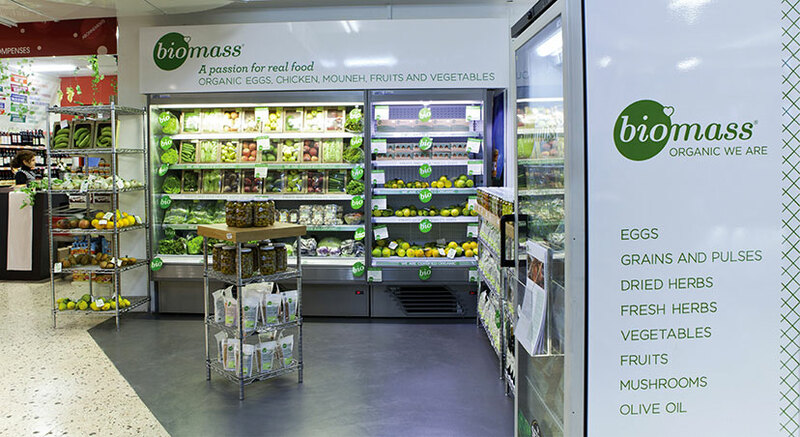 The Biomass fresh fruit and vegetable packs are designed for maximum visibility when piled on a shelf. The slight shift in the box die-cut allows for clear product and brand visibility whether laying or standing – a way to accommodate different supermarket shelving space. The bagged products from biomass have a generic package with differentiating stickers and a clear exposure of contents. 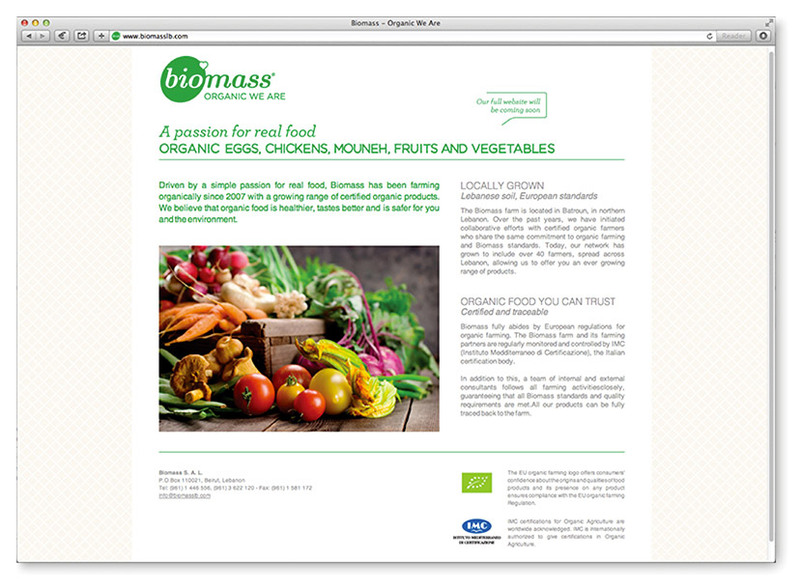 The objectives behind Biomass’s communication strategy are the following: maintain and build on the perception of Biomass as the leading grower and supplier of organic produce in Lebanon, position the brand as a provider of an expansive and expanding range of organic products, and widen the target audience by increasing interest in organic food. 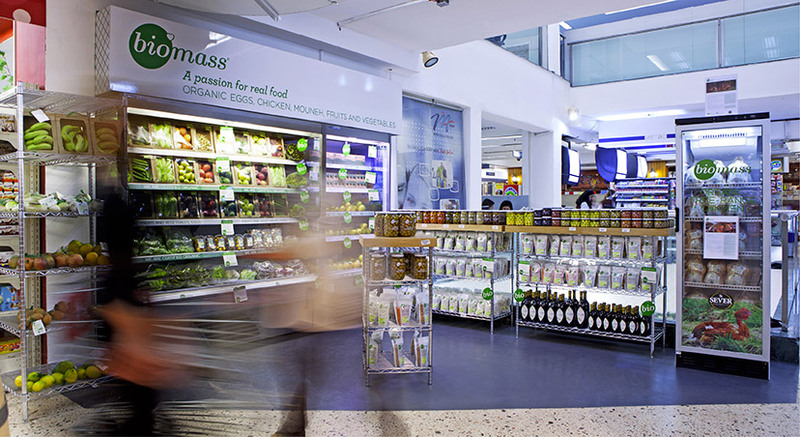 Tactically, these objectives were achieved by strengthening the brand through dedicated stands and corners at supermarkets, enhancing its presence in food-related events, cross-selling products on packaging, providing information to the public about the health and taste benefits of organic produce, and telling the inspiring story behind the Biomass family business. 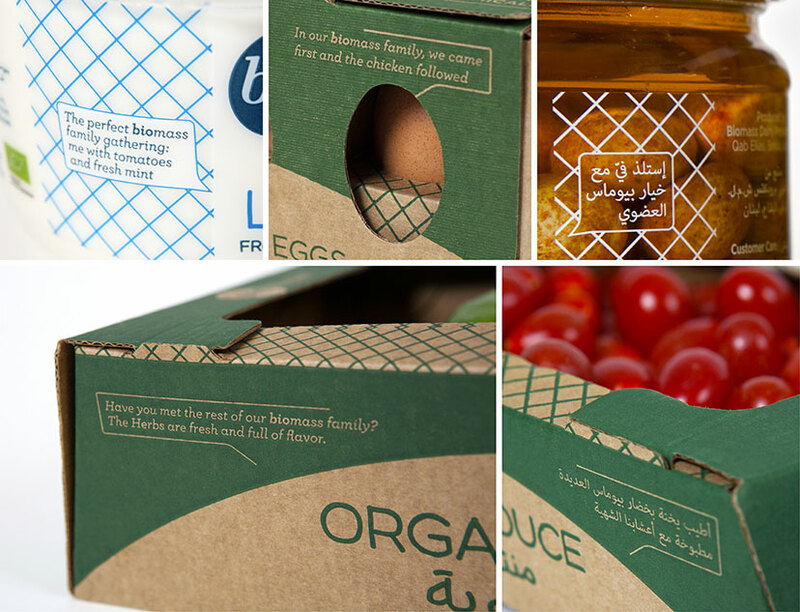 Using multiple channels and scales – from little packaging “talkies” to fully branded organic corners – the brand voices out what it’s all about. The Biomass organic supermarket corner became a reliable destination for keen organic consumers, wide with choice and variety, and capable of drawing in new members to the club. 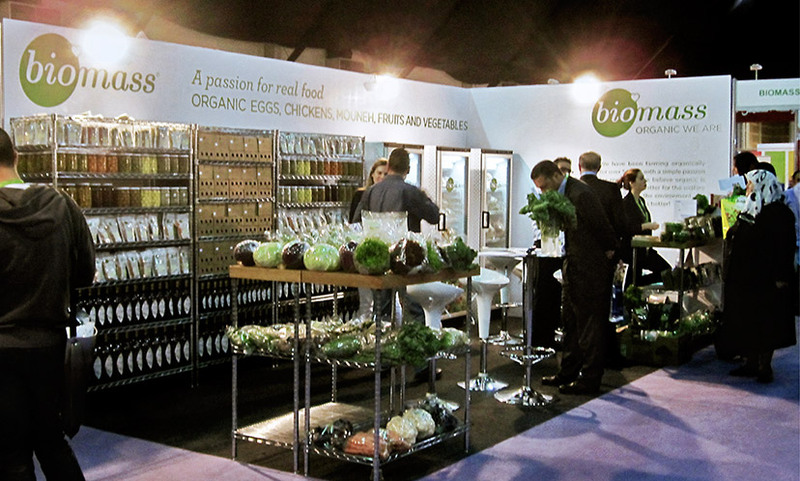 The Biomass stand in the HORECA 2013 fair establishes the brand’s unmistakable authority as Lebanon’s main farmer and supplier of organic produce. Communication on the benefits of organic food, as well as products growing in popularity, furthers from the reach and influence of the Biomass brand.